The Oakland East Bay Symphony rewarded the faithful Friday night at the Paramount Theater with an exhilarating performance by Mikhail Simonyan. 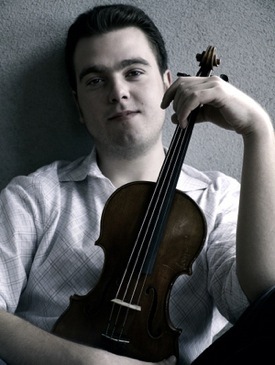 The 23-year-old violinist blistered the air (if not the hairs of his bow) in Aram Khachaturian’s Violin Concerto, bowing as fiercely as any Appalachian fiddler. And then he soared in the legato movement with deeply felt folk material. After the success of last year’s Persian-themed concert, conductor Michael Morgan was approached by Oakland Symphony violinist Heghine Boloyan, asking if he was interested in programming an evening of Armenian composers. He immediately agreed, but made it Boloyan’s task to find the funding and to decide on the music. Morgan warmed up with Mozart’s Symphony No. 38 in D Major, the “Prague” Symphony. Written at the relatively advanced age of 30 (he died at 36), Mozart’s writing is already mature, with sureness that borders on the proud. Small gestures in the first violins slowly mutated into full-throated horns. Then the Andante developed a sweetness that is Mozart’s signature. Half simplicity and half faith in his fellow, it held an enduring grace. Simonyan took the stage and the orchestra’s response bordered on frenzy. Khachaturian opened with big blocks of sound, as hard and translucent as an office building, a jazz of steel and glass. What followed was a powerful and individualistic performance of sharply articulated violin runs followed by edgy and incisive brass. This was more surprising after the rounded delivery of the Mozart. Front-accented grace notes gave an explosive quality to each measure. The runs were simple in structure but severely demanding in tempo and cross-accents. Simonyan took a boxer’s bent-kneed stance and brought remarkable clarity to each note. The broad use of repetition and colorful unisons extolled the folk elements. In the slower middle movement one could enjoy the slurs, with their bent pitches and roving key. And Khachaturian’s extensive bassoon and viola parts were a relief from Western usage. A second surprise was Edvard Mirzoyan’s Symphony for Timpani and String Orchestra. Likewise inspired by Armenian folk accents and tetrachords, Mirzoyan wrote low in each instrument for a meaty sound. The violins, usually clean and pitch perfect, sounded choral as they sloshed through harmonic passages, adding a vocal element to replace winds. The unusual pairing of strings and timpani, played by Tyler Mack, generated a surprising wealth of timbres. A viola’s slashing rhythms turned to slow cello in the Adagio, rich and very Barber with its dense chromatic phrases. The program concluded with two somewhat lurid choral pieces that were well received by the sizable Armenian part of the audience. The Seemorgh Ensemble, a largely Persian community chorus augmented with professional singers ands some local Armenian talent, performed two Edgar Hovhannisyan songs, the stirring anthem-like Yerevan Erebooni and the martial Sardarapat, under the preparation of Artin Der Minassians. Yerevan was founded in the eighth century B.C. and managed to stay a small town for 2700 years. But after the Turkish genocide of their own Armenian citizens, refugees swelled Yerevan, and it returned to the world stage as capital of Armenia. The song is a paean to heartland. The land-locked highlands of Armenia, positioned between Azerbaijan, Turkey, Persia, and the Caucasus mountains of Georgia (formerly USSR), are placed en route for conquering empires (Persian, Roman, Ottoman). And its early acceptance of Christianity left it surrounded by increasingly hostile Moslem nations, resulting in a state of sufferance, and, at times, persecution. California’s central valley became a haven for displaced Armenians in the 1920s. Morgan rewarded the Armenian audience in particular when he forsook the program and swept into the Sabre Dance from Khachaturian’s ballet, Gayane. This well-known piece, with its staccato urgency and driving rhythms, has become a stable, not just of the repertoire, but also of our culture. The Oakland Symphony’s concert was a proud night for the Bay Area Armenian community. They banded together to raise money for the concert and filled the 3,000-seat Paramount. At a reception following the concert, Morgan promised to do another Armenian concert in two years, after performing Persian music again next year.